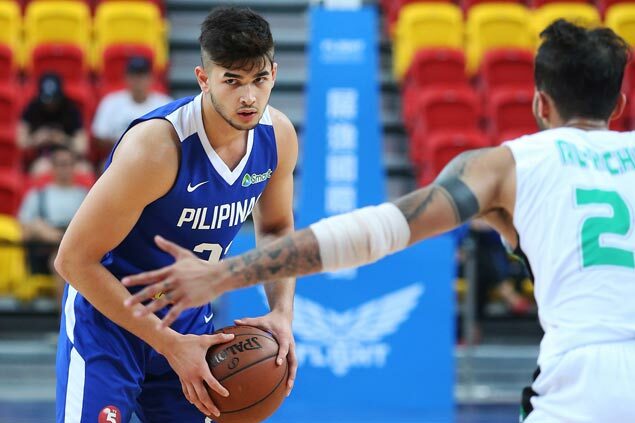 TAIPEI - Kobe Paras is perhaps the most celebrated prospect to come out of high school since his dad Benjie over two decades ago. But as a first-timer at Gilas Pilipinas, he's not spared from rookie duties like lugging heavy team equipment to the gym for practices and games. "Ganyan naman po talaga sa team, kami naman ang baguhan," he said. It has been the same way in Gilas Pilipinas' games, where the teenager who has filled up YouTube and Facebook with highlight dunks from his games with Cathedral High School in Los Angeles and in practices has gone through a rough baptism of fire. His debut for the national men's team in the 39th Jones Cup has more or less been an eye-opener for the 6-foot-6 Paras who has logged a grand total of 36 minutes in the five games that he has played and was relegated as a reserve in the two others. Paras averaged two points in those five games and clearly struggled to fit in or live up to the hype built around him by fans and media alike who see in the athletic, high-flying wingman the country's best chance to finally put a homegrown Filipino player in the NBA. The sheer weight of expectations has also clearly gotten to Kobe, at least in the first few games, where he was so eager to impress that he wanted to go for a dunk right in his first touch - and each time ended up taking a bad shot. That was none more apparent than in his debut game against Canada, where Paras scooted downcourt the moment he got the ball, put his head down, then ended up kissing the ball too strong off the backboard on his layup. 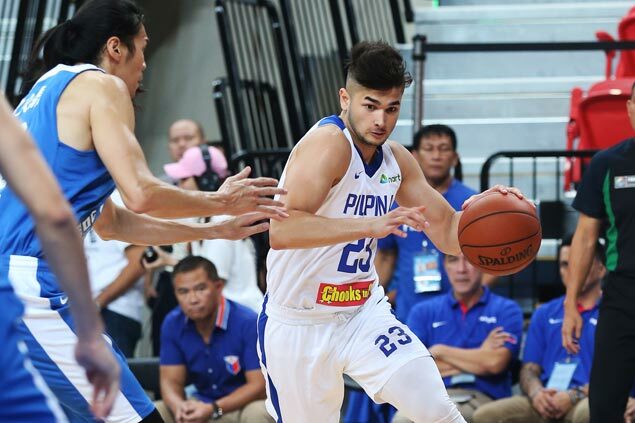 Despite the struggle, Gilas coach Chot Reyes said he understands what Paras is going through and, in fact, admires the youngster for the way he's handling everything happening around him, which may be too much for most teens to handle. "He understands that he needs to shut out all the hype and everything else outside of this team," said Reyes. "And like I told him, I was very impressed with the way he's handling things." Paras has shown his frustrations during games at times and expressed as much on social media, but at least he's beginning to turn the corner in his last two games with Gilas. He got a rare start in the game against Japan and looked a lot more relaxed on the floor, letting the game come to him instead of forcing things. The teenager was more settled in the game against Iraq, where he made two big defensive stands, made one extra pass instead of settling for a three-point shot, and was soon rewarded with his first dunk of the tournament. The kid is beginning to grasp the concept. "Coach Chot just tells me that I should relax. Kasi nga, nakikita n'ya na nanggigigil ako. He just tells me na, 'Just play your game.' And yesterday and two games before that, okay naman pinakita ko so I'm happy with the defense I played," he said. "Coach Chot naman didn't give any promises. You get the minutes that you deserve. So I'm just happy that last game, he started me and that was the first time I started since high school. So I'm just happy na may tiwala s'ya sa akin." Reyes is seeing the progress, but nonetheless insisted that there will be no special treatment for Paras and fellow amateur stars Kiefer Ravena and Rayray Parks. "He knows that there are no entitlements in this team, kaya that was the first thing I told Kobe, Rayray (Parks) and Kiefer (Ravena) when they said they want to come in and join the program," he said. "The first thing I said was you have to earn your spot, earn your minutes. That's what they're doing." By learning to take it slow, Paras has hastened his growth as a player. "I wanna be a role player as of now and I don't want to do anything too much. I just wanna do what Coach Chot feels would be better for the team," he said. "The goal is to create good shots, open shots, and not try to do too much for the team." These, of course, are mere baby steps for a kid who carries the hoop hopes of a nation on his shoulders. But at least, there is now a clear understanding of what he needs to do moving forward - and a willingness to go through the process. There's also the genuine desire to play for the national team. "I'm happy, actually, because there are a lot of 19 year olds out there who aren't in the (national) team, so I'm looking at it has a blessing that God gave me a chance to be part of the team and learn from professionals, from coaches who've been through a lot," Kobe said. "So I'm just happy to be here representing the country."